Africa: Defections and Deflections - Who Now Holds the Balance of Power in Nigeria? Dozens of politicians, including the Senate President and three governors, have defected from the ruling party. There could be more to come. 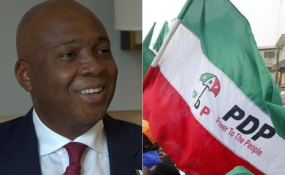 This week, another tremor ran through Nigeria's turbulent political landscape as Senate President Bukola Saraki walked out of the ruling party. Explaining why he had left the All Progressives Congress (APC), the country's third most senior politician said his position in the party had become untenable. "All governance principles which were required for a healthy functioning of the party and the government were deliberately violated or undermined," he wrote in a letter. In departing, Saraki followed in the footsteps of the 14 senators and 37 members of the House of Representatives who dramatically left the APC last week. They too complained of being side-lined and criticised different aspects of President Muhammadu Buhari's governance over the party and country. The APC has been quick to hit back at the defectors. Just hours after Saraki's announcement, the party's National Working Committee signed a resolution accusing the Senate President of having brought the APC into disrepute, including by "presiding over anti-APC activities". Information Minister Lai Mohammed said the party had lost nothing from his departure since "Saraki has behaved all along as a member of the opposition". In response to last week's mass defection, the party had similarly tried to downplay the developments. Presidential spokesperson Garba Shehu described the events as "a seasonal occurrence", while APC chair Adams Oshiomhole suggested the defectors were simply motivated by selfish political interest. Mohammed had previously told African Arguments: "If anybody defects from the APC, I don't think it's going to affect the fortunes of the party". Despite this bluster, however, the ruling party will be concerned. Overnight, the embattled party became a minority in the Senate and saw its majority in the House of Representatives significantly slashed. The APC has always been riven with divisions, reflecting its origins in 2013 as a coalition of smaller opposition parties. But since it achieved its founding aim of coming to power in 2015, its leadership has struggled to keep its members content and in line, whether through the carrot or the stick. It was long expected that several politicians would defect as the 2019 elections approached. The first significant move came this June when Buhari's former ally Buba Galadima announced a breakaway faction of the ruling party called The Reformed APC (R-APC). "The APC has run a rudderless, inept and incompetent government that has failed to deliver good governance to the Nigerian people," he said. A month or so later, many more followed suit. Most have crossed the floor to the main opposition People's Democratic Party (PDP), which now leads an alliance of 38 parties. Known as the Coalition of United Parties (CUPP), this conglomeration is dedicated to changing the government, somewhat reminiscent of the APC before 2015. CUPP has gained in strength with defections and high-profile endorsements. These include former president Olusegun Obasanjo and former vice-president Atiku Abubakar, who returned to the PDP in late-2017 and is the frontrunner to be the opposition grouping's presidential candidate. With the 2019 elections, scheduled for February and March, fast approaching, the political momentum is clearly with the opposition. But overall, the balance of power remains finely poised. Some analysts argue the APC remains the dominant party, but suggest that Nigeria's state governors will be particularly important going forwards. Under the country's federalised system, these politicians are highly influential and are key to delivering votes. "The PDP have definitely been emboldened by the defections, but as long as Buhari retains his most influential governors and can get a couple of opposition governors to work for him, he will not be troubled," says Japheth Omojuwa, chief strategist at Alpha Reach Consulting. Political analyst Remi Adekoya echoes this. "Roughly two-thirds of the country's 36 governors are currently affiliated with APC. If they stick with the party, then it could hold on to power," he says. Worryingly for the APC, it has already lost three crucial governors. Firstly, Samuel Ortom of Benue State defected last week, citing the government's failure to address the conflict between herders and farmers. Secondly, Abdulfatah Ahmed of Kwara State returned to the PDP this week having criticised the government openly in recent days. Ahmed's announcement came shortly after Saraki's declaration. Both men are allies from Kwara and their joint defection is likely to bring the key swing state closer to the PDP. And finally, Aminu Tambuwal, the governor of Sokoto, decamped just last night, citing the APC's failures in government. He is reportedly frustrated with the ruling party's internal discord and is understood to harbour presidential ambitions that cannot be realised within the ruling party with Buhari set to run for a second term. On top of those three governors, the ruling party is also likely to be particularly concerned about the loss of Rabiu Kwankwaso. Although now a senator, he was governor of Kano in 2015 when he helped Buhari win the state by an overwhelming landslide. With Kwankwaso's support, Buhari picked up by far more votes in Kano than in any other state. But now, the former governor's return to the PDP has put Nigeria's second most populous state back into play. As Nigeria gets closer to the elections, observers anticipate more defections and are keeping a particular eye on certain influential individuals. Speaker of the House of Representatives Yakubu Dogara, for example, is expected to leave the APC before too long. With regards to many other defections, however, much rests on how well the ruling party can persuade its members that their ambitions are better served within rather than outside the party. Both the PDP and APC are offering inducements to politicians to either stay loyal or switch allegiances. Following the recent defections, for example, a group of politicians who stayed in the APC claimed that the PDP had made attractive offers to lure their colleagues into its ranks. The expressed surprise that the opposition hadn't managed to persuade even more. This group then demanded that the ruling party consolidate its membership by guaranteeing loyal lawmakers that they will automatically be on the APC's ticket in the upcoming elections. APC chair Oshiomhole rejected their request and responded with fighting talk. He said that the party would not induce members with "dollars" or "automatic tickets" to stop them leaving, adding that defectors should know that their "access to the CBN [Central Bank of Nigeria]... and NNPC [Nigerian National Petroleum Corporation] has been cut off". It remains to be seen if this strategy will work in stemming the flow of defectors to the growing opposition. In 2013, dozens of lawmakers fundamentally altered Nigeria's political constellation as they decamped from the once all-powerful PDP to the newly-formed opposition coalition. The alliance lacked internal coherence, but its members were united in their desire to remove the PDP from power. Fast-forward five years and the defections are now happening in reverse. The APC is the one unravelling and the PDP is trying to hold together disparate strands and personalities, hoping that the objective of replacing Buhari is enough to hold the assorted whole together. As before, the elite horse-trading and deal-making that defines Nigeria's unpredictable politics has left things finely balanced with both main parties trying to seek the advantage. With its new numbers in the National Assembly, the PDP could now decide to disrupt the running of government. Meanwhile, as the benefits of incumbency diminish, the APC could decide it needs to raise even higher sums of money to contest these ever-tighter elections. Either way, it is, as always, ordinary Nigerians that will pay the price of this form of politics.